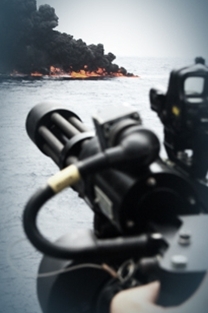 All warships carry small-calibre guns for use against both surface and airborne targets. Unlike the majority of the ships weapons systems, these guns are not radar and computer controlled, but aimed and fired by the upper deck gun crews. The weapons range in calibre and complexity. In addition to the major weapons systems, all RN warships carry small-calibre guns for use against both surface and airborne targets.